Married Name 8 October 1892 As of 8 October 1892,her married name was Klippstein. Emilia Sophie Fredricke Krey was born on 1 February 1874 at Germany. She was the daughter of Gottlieb William Fredrick Krey and Wilhelmine Ernestine Raedel. Emilia Sophie Fredricke Krey died on 7 September 1950 at Sauk, Wisconsin, at age 76. Emilia Sophie Fredricke Krey had 3 with 3 living in 1900 children. On 6 July 1924 at Krey Family Reunion. [S386] Lutheran Church, Evangelical Lutheran Church Records 1875-1940. [S246] U.S. Federal Census 1880 U.S. Federal Census, by Ancestry.com, Year: 1880; Census Place: Honey Creek, Sauk, Wisconsin; Roll: 1446; Family History Film: 1255446; Page: 138A; Enumeration District: 254; . [S245] U.S. Federal Census 1900 U.S. Federal Census, by Ancestry.com, Year: 1900; Census Place: Franklin, Sauk, Wisconsin; Roll: T623_1816; Page: 2A; Enumeration District: 134. Name Variation August Friedrich Wilhelm Klippstein was also known as August Fredrick. August Friedrich Wilhelm Klippstein was born on 26 May 1867 at Germany. He was the son of Fritz Klippstein and Wilhelmina Zeck. August Friedrich Wilhelm Klippstein died on 17 May 1953 at Sauk, Wisconsin, at age 85. On 6 July 1924 at Krey Family Reunion. [S246] U.S. Federal Census 1880 U.S. Federal Census, by Ancestry.com, Year: 1880; Census Place: Franklin, Sauk, Wisconsin; Roll: 1446; Family History Film: 1255446; Page: 96D; Enumeration District: 251; . Name Variation Henriette Karoline Auguste Krey was also known as Henrietta. Married Name 27 September 1894 As of 27 September 1894,her married name was Kruse. Henriette Karoline Auguste Krey was born in September 1876 at Sauk, Wisconsin. 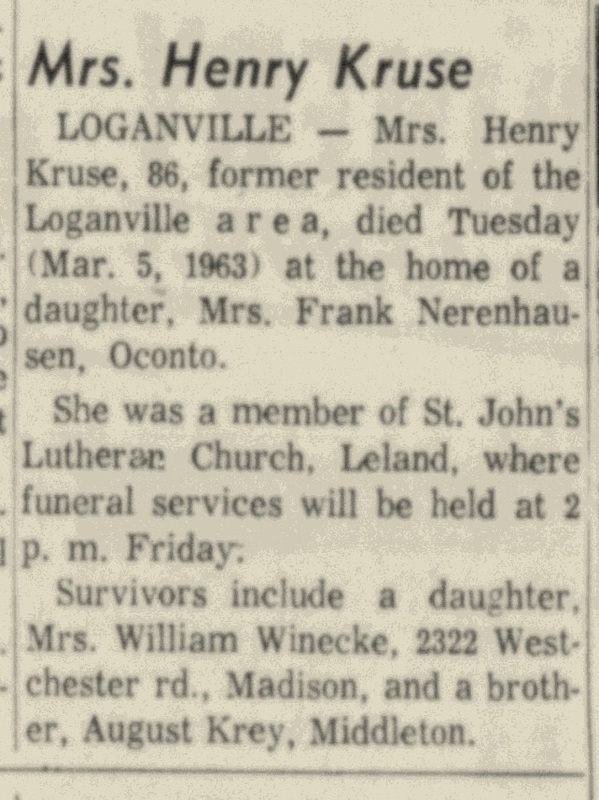 Henriette Karoline Auguste Krey died on 5 March 1963 at Sauk, Wisconsin, at age 86 Mrs Henry Kruse (Henriette Krey) obituary. Henriette Karoline Auguste Krey had 6 with 5 living in 1910 children. On 6 July 1924 at Krey Family Reunion. [S244] U.S. Federal Census 1910 U.S. Federal Census, by Ancestry.com, Year: 1910; Census Place: Franklin, Sauk, Wisconsin; Roll: T624_1736; Page: 4B; Enumeration District: 0115; FHL microfilm: 1375749. [S243] U.S. Federal Census 1920 U.S. Federal Census, by Ancestry.com, Year: 1920; Census Place: Franklin, Sauk, Wisconsin; Roll: T625_2015; Page: 4A; Enumeration District: 164; Image: 76. [S250] U.S. Federal Census 1930 U.S. Federal Census, by Ancestry.com, Year: 1930; Census Place: Franklin, Sauk, Wisconsin; Roll: 2609; Page: 2B; Enumeration District: 13; Image: 112.0; FHL microfilm: 2342343. Name Variation Henry George Kruse was also known as Georg Heinrich. Henry George Kruse was born in July 1865 at Germany. He was the son of Heinrich Peter Christoph Kruse Sr. and Anna Margaretha Sandlabam. Henry George Kruse died in 1941 at Sauk, Wisconsin. On 6 July 1924 at Krey Family Reunion. On 8 May 1928 Mrs. Hy Winecka (Herman Winecke) and daughters visited her parents, Mr and Mrs Henry Kruse, at White Mound, Sunday. [S246] U.S. Federal Census 1880 U.S. Federal Census, by Ancestry.com, Year: 1880; Census Place: Roxbury, Dane, Wisconsin; Roll: 1422; Family History Film: 1255422; Page: 309D; Enumeration District: 086; . Name Variation Augusta Wilhelmima Krey was also known as Augusta Marie. Married Name 2 June 1895 As of 2 June 1895,her married name was Yanke. Married Name 2 June 1895 As of 2 June 1895,her married name was Yahnke. Augusta Wilhelmima Krey was born in June 1875 at Wisconsin. Augusta Wilhelmima Krey died on 23 May 1953 at Dane, Wisconsin, at age 77. Name Variation William F. Yanke was also known as Yahnke. William F. Yanke was born in May 1871 at Sauk, Wisconsin. William F. Yanke died on 12 July 1960 at Sauk, Wisconsin, at age 89. Name Variation August Fredrick William Krey was also known as August W.
August Fredrick William Krey was born on 22 September 1883 at Sauk, Wisconsin. He was the son of Gottlieb William Fredrick Krey and Wilhelmine Ernestine Raedel. August Fredrick William Krey married Katherine Robb, daughter of John Robb and Maggie (? ), circa 1908. August Fredrick William Krey died on 9 March 1965 at Dane, Wisconsin, at age 81. [S244] U.S. Federal Census 1910 U.S. Federal Census, by Ancestry.com, Year: 1910; Census Place: Franklin, Sauk, Wisconsin; Roll: T624_1736; Page: 10A; Enumeration District: 0115; Image: 901; FHL Number: 1375749. [S243] U.S. Federal Census 1920 U.S. Federal Census, by Ancestry.com, Year: 1920;Census Place: Middleton, Dane, Wisconsin; Roll: T625_1982; Page: 1B; Enumeration District: 70; Image: 186. [S250] U.S. Federal Census 1930 U.S. Federal Census, by Ancestry.com, Year: 1930; Census Place: Middleton, Dane, Wisconsin; Roll: 2567; Page: 9B; Enumeration District: 57; Image: 956.0. Married Name circa 1915 As of circa 1915,her married name was Krey. Ella Ida Kopf was born on 17 September 1894 at Sauk, Wisconsin. She married Edward Emil Krey, son of Gottlieb William Fredrick Krey and Wilhelmine Ernestine Raedel, circa 1915. Ella Ida Kopf died on 28 September 1978 at Sauk, Wisconsin, at age 84. Roy Erickson married Theresa Krey, daughter of Gottlieb William Fredrick Krey and Wilhelmine Ernestine Raedel, before 1980. Name Variation Wilhelmina (?) was also known as Henriette (?). Name Variation Wilhelmina (?) was also known as Hanna Magdalena (?). Wilhelmina (?) was born on 2 December 1827 also reported as circai 1817. She died on 11 June 1910 at age 82. Susan K. Gade was born on 23 September 1958 at Sauk, Wisconsin. She was the daughter of Arnold Gade and Helen E. Krey. Susan K. Gade died on 16 February 1990 at California at age 31. Married Name Her married name was Krey. Lila Frances Rick married William Krey, son of Oscar Ludwig Krey and Paula Mary Mueller. Lila Frances Rick was born on 12 March 1923 at Wisconsin. She died on 3 August 1976 at age 53. 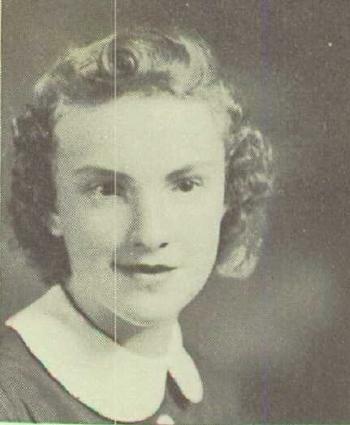 Lila Frances Rick graduated in 1941 at Reedsburg High School, Reedsburg, Sauk, Wisconsin. Married Name 2 January 1918 As of 2 January 1918,her married name was Alwin. Lucille Ella Kruse was born on 1 May 1899 at Merrimac, Sauk, Wisconsin. She was the daughter of Henry George Kruse and Henriette Karoline Auguste Krey. Married Name 17 October 1917 As of 17 October 1917,her married name was Winecke. Married Name 17 October 1917 As of 17 October 1917,her married name was Wineke. Alice Anna Kruse was born on 31 December 1897 at Merrimac, Sauk, Wisconsin. 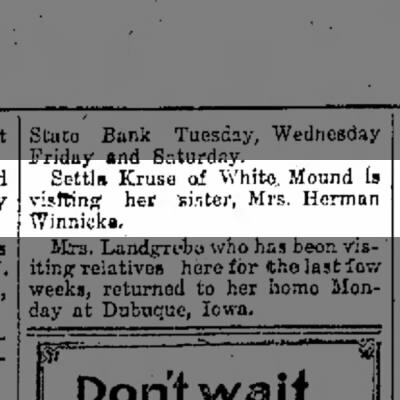 On 14 January 1922 Stella Kruse of White Mound is visiting her sister, Mrs. Herman Winecke. 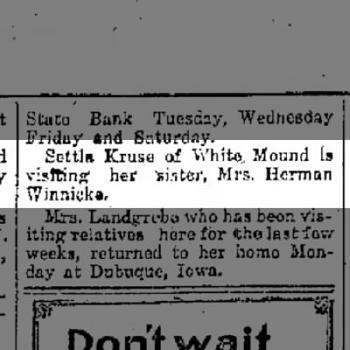 On 8 May 1928 Mrs. Hy Winecka (Herman Winecke) and daughters visited her parents, Mr and Mrs Henry Kruse, at White Mound, Sunday. Married Name 1948 As of 1948,her married name was Harris. Selma Tilker was born in 1910 at Reedsburg, Sauk, Wisconsin. She was the daughter of Herman Carl Tilker and Anna Louise Krey. Selma Tilker married Sherwin B. Harris Jr. in 1948. Selma Tilker died on 7 December 2004 Selma Tilker Harris, age 94, of Meriter Health Center, Madison, died Tuesday evening, Dec. 7, 2004, peacefully in her sleep. She was born in Reedsburg in 1910, the daughter of Herman Tilker and Anna (Krey) Tilker. She was graduated with honors from Madison Central High School in 1928, and completed nurses' training at the University of Wisconsin in 1932. She continued at the university, receiving her B.S. degree in sociology in 1935. Selma joined United Airlines in 1936, pioneering as the first stewardess from Madison, clocking in more hours in the air than any other stewardess of her time. In these exciting early days of flying, she traveled extensively throughout the U.S., and was based in Chicago and later San Francisco. In 1948, she married Sherwin B. Harris Jr. ("Bucky"), originally of Buffalo, N.Y., and moved to Norwalk, Ohio, where they lived for three years while he was president of Mary Lee Candies. They then moved to Pelham Manor, N.Y., where she lived until 1988 (with a year spent back in Madison, 1962-63). Her husband held a number of top executive positions in Manhattan, including president of Louis Sherry, Holly Corp., chairman of Childs Restaurants, Executive Search Corp., Caribbean Material & Supply Co., and went on to found Harris & Harris Management Consultants and Computer Tutors Corp. He died in 1970, at age 61. Selma moved back to Madison in 1987, living on Monroe Street, Meriter Terrace and finally at Meriter Health Center, where she received loving care until her death. Selma was a very caring and loving person. She will be greatly missed. Survivors include her son, Sherwin III, a Manhattan-based art director and graphic designer, and his wife, Peggy, an interior designer, of Mount Vernon, N.Y; sister-in-law, Catherine Tilker of Lodi; nieces, Ruth Rogers of Sun Prairie and Chris Scoville of Cottage Grove, and Elaine Gomperts of Penfield, N.Y; nephews, Tom Tilker of Colorado Springs, Colo., Jim and Steve Tilker, of Phoenix, Ariz., Dennis Pearson, now in New Zealand, Jerry Tilker of Fort Wayne, Ind., Tom Harris of Anaheim, Calif., and Craig Harris, of Wilmington, N.C; and cousins. She was also preceded in death by her parents; seven brothers, Lawrence, Clarence, Herman, Frederick, William, John and Lucien Tilker; and her sister, Lucy Pearson. Funeral services will be held on Saturday, Dec. 11, 2004, at 11 a.m. at SCHROEDER CRESS FUNERAL HOME, 3325 E. Washington Ave., Madison. The Rev. Glen Reichelderfer and the Rev. John Thomas, of Christ Presbyterian Church, will officiate. Visitation will be held one hour prior to the services at the funeral home. Burial will follow in Forest Hill Cemetery. Cress Funeral and Cremation Service 3325 E. Washington Ave. In July 1940 Mr and Mrs Herman Carl (H. C.) Tilker family visiting with relatives including her brother Laurence Krey and family, and her sister Mrs Theresa Funte. Name Variation Sherwin B. Harris Jr. was also known as Bucky. Sherwin B. Harris Jr. was born circa 1909. 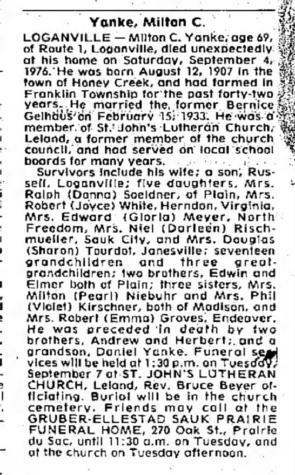 He married Selma Tilker, daughter of Herman Carl Tilker and Anna Louise Krey, in 1948. Sherwin B. Harris Jr. died in 1970. Lawrence Otto Tilker was born on 11 January 1906 at Reedsburg, Sauk, Wisconsin. He was the son of Herman Carl Tilker and Anna Louise Krey. Lawrence Otto Tilker died before 1984. 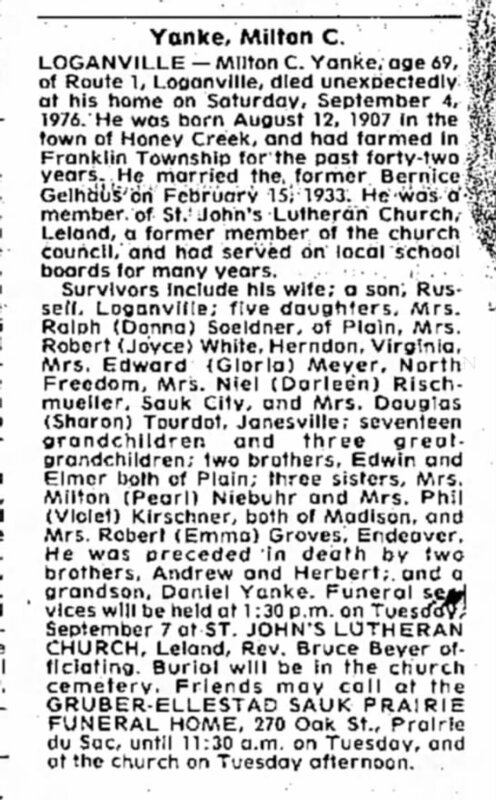 Clarence Frederick Tilker was born on 9 August 1904 at Reedsburg, Sauk, Wisconsin. Clarence Frederick Tilker married Helen Lucile Moore on 16 May 1938 at Dubuque, Iowa. 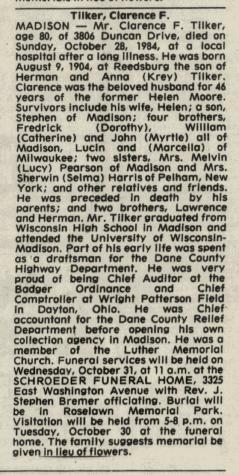 Clarence Frederick Tilker died on 28 October 1984 at Madison, Dane, Wisconsin, at age 80 Clarence F Tilker obituary. Name Variation Waldemar Herman Tilker was also known as Herman. Waldemar Herman Tilker married Neva L. (?). Waldemar Herman Tilker was born in October 1913 at Sauk, Wisconsin. He was baptized in October 1913 at St John Lutheran Church, Reedsburg, Sauk, Wisconsin. Waldemar Herman Tilker died in 1981. Name Variation Friedrich Wilhelm Tilker was also known as Frederick. Friedrich Wilhelm Tilker married Dorothy (?). Friedrich Wilhelm Tilker was born on 31 May 1912 at Wisconsin. Friedrich Wilhelm Tilker was baptized on 21 July 1912 at St John Lutheran Church, Reedsburg, Sauk, Wisconsin. Name Variation Wilhelm Theodore Tilker was also known as William. Wilhelm Theodore Tilker married Catherine Bartholomew. 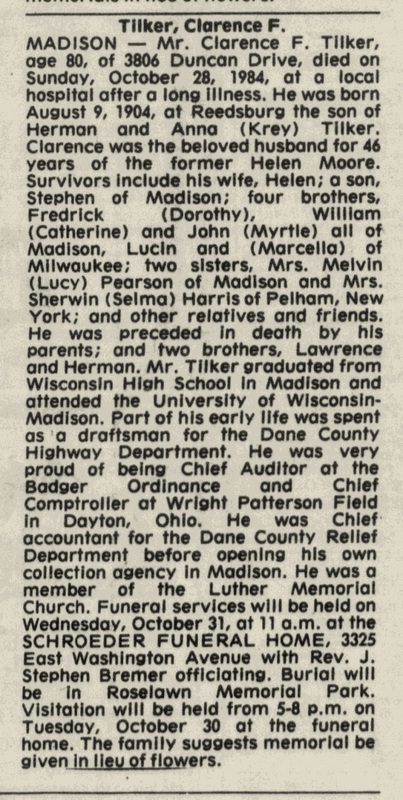 Wilhelm Theodore Tilker was born on 23 March 1916 at Wisconsin. Wilhelm Theodore Tilker was baptized on 9 April 1916 at St John Lutheran Church, Reedsburg, Sauk, Wisconsin. He died on 14 October 1991 at Dane, Wisconsin, at age 75. John H. Tilker married Myrtle A. Nesbitt. John H. Tilker was born on 2 April 1918. John H. Tilker died on 9 April 1998 at age 80. Name Variation Lucien Tilker was also known as Lucin. Lucien Tilker married Marcella (?). Lucien Tilker was born on 15 November 1921. Lucien Tilker died on 9 September 1999 at age 77. Married Name Her married name was Pearson. Lucy Tilker married Melvin Pearson. Lucy Tilker was born on 18 January 1909. Lucy Tilker died between 1984 and 2004. Melvin Pearson married Lucy Tilker, daughter of Herman Carl Tilker and Anna Louise Krey. Melvin Pearson was born on 23 May 1905. He died on 7 April 1978 at age 72. Elmer Roy Yanke married Regina R. (?). Elmer Roy Yanke was born on 19 June 1903 at Honey Creek, Sauk, Wisconsin. He was the son of William F. Yanke and Augusta Wilhelmima Krey. Elmer Roy Yanke died in 1983. Married Name Her married name was Niebuhr. Pearl Minnie Yanke married Milton Niebuhr. Pearl Minnie Yanke was born on 21 February 1905 at Honey Creek, Sauk, Wisconsin. She was the daughter of William F. Yanke and Augusta Wilhelmima Krey. Pearl Minnie Yanke died on 6 June 2002 at age 97. Married Name Her married name was Nerenhausen. Name Variation Stella Marie Kruse was also known as Stella Mary. Stella Marie Kruse married (?) Nerenhausen. Stella Marie Kruse was born on 20 October 1905 at White Mound, Sauk, Wisconsin. Stella Marie Kruse died on 3 January 1995 at Wisconsin at age 89. Clarence Herman Albers was born on 17 May 1906 at Honey Creek, Sauk, Wisconsin. He was the son of Albert Lewis Albers and Mathilde Krey. Clarence Herman Albers died on 18 September 1980 at Sauk, Wisconsin, at age 74. Milton Chester Yanke was born on 12 August 1907 at Honey Creek, Sauk, Wisconsin. Milton Chester Yanke married Bernice V. Gelhaus, daughter of (?) Gelhaus, on 15 February 1933. Milton Chester Yanke died on 4 September 1976 at age 69.